About 30 years ago, Casey Carle set a goal "to make people laugh and to make them go 'wow!' "He translated that desire into a career that has far exceeded his expectations. Carle is considered one of the greatest "bubble artists" on the professional circuit today. 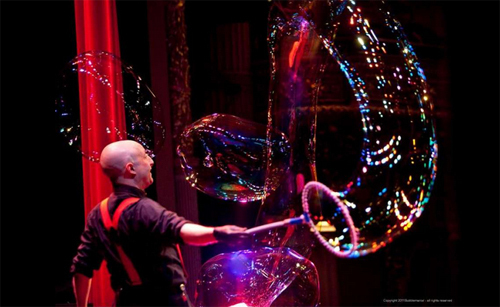 During his shows, he creates a plethora of dazzling bubbles in various shapes and sizes, even "trapping an audience member inside a gigantic soap bubble." Humor and audience interaction are part of his charm. Carle, a favorite with Stamford-area audiences, returns to the Palace Theatre on Sunday afternoon, Jan. 15, with "BubbleMania!" The theater said his shows, combining art and comedy, are for all ages. When we caught up with Carle, he was waiting for his luggage at an arrivals' carousel, following a flight from Boca Raton, Fla., into Washington National Airport, near downtown D.C. "I have about 10 minutes for this interview," he said. And he wasn't kidding. "Then I have to get the (rental) car, and pick up my wife at the train station." She was traveling from their Connecticut home to Washington, D.C., specifically to meet her husband, see his New Year's Eve shows in VA and continue on to a vacation together to Puerto Rico. This is the hectic on-the-go life of Carle, who hopscotches across the U.S. and abroad for about 350 shows a year. Folks in India, Japan and the United Arab Emirates are among his fans. He also has done numerous television commercials, corporate meetings/conferences and science center shows. It's no wonder that when he's not traveling, he prefers to work on his new routines in a peaceful setting in East Haddam, CT. "We live on a single-lane dirt road with a creek running through our property. It's pretty and it's quiet." Asked about his fascination with bubbles, Carle said he realized while getting this theater degree in college that although he enjoyed working as an actor, director and stage manager, "what I really liked was being an character actor in plays for children," he writes on his website. "The zanier the play, the more I liked it." And since he was hooked on "zaniness," a friend suggested he become a circus clown. By the late 1980s, he found himself working for the Ringling Bros. and Barnum & Bailey circus. "I tried juggling, magic, uni-cycling, but what I liked best was using bubbles to amaze and amuse". "My bubble act in the circus was the first of its kind and I was the first person in the history of the world to put people inside bubbles as part of a circus routine. When I left the circus and started doing my own show, so many people liked it that I knew it was going to be 'my thing.' But even then I had no idea just how big of a 'thing' it was going to be," he says. And how does he describe what he does for a living? "I'm a manipulator of spherical rainbows for human entertainment," he said, laughing. "Every show is different," as he alters it to suit the interests of his audiences. "It's fresh, again and again. I never tire of it."